Ms Nguyen Thi Thanh is The Lunch Lady. An international street food star, her modest stall in Saigon is packed daily with locals, tourists, bloggers and journalists, all wanting to try her famous ‘rotating menu’ (a different dish is served each day of the week). Anthony Bourdain is credited (although I’m not sure he would view this as a positive) for propelling The Lunch Lady into the foodie hall of fame. However, she already had a reputation for quality fare among locals and food bloggers before Bourdain’s show aired in 2009 – how else would the No Reservations team have found her. A lot has been written about The Lunch Lady, the vast majority of which has been positive, but, more recently, there has, inevitably (and, I think, necessarily), been a reaction against all the praise which this street food stall receives. It is, after all, just one noodle joint in a city of tens of thousands of them, some of which also have ‘rotating menus’. I have, of course, eaten at Ms Nguyen Thi Thanh’s stall many times before, and I like it, a lot. But this week I’m going to eat my lunch at The Lunch Lady every day to see if I can add anything to the great Lunch Lady debate. Description: It’s a beautiful, hot and sunny day in Saigon today. I arrive at The Lunch Lady’s shady corner in a good mood after a refreshing swim at Hai Quan Pool, but my spirits are dampened somewhat when a bird craps on my bike as soon as I arrive – a bad omen? Today’s dish is bún Thái which, as the name suggests, is a Vietnamese take on a classic Thai soup. Ms Nguyen Thi Thanh and her staff remember me and greet me with a polite, “Why haven’t you eaten here in such a long time?” I make my excuses and tell her that this week, to make up for my absence, I’ll be eating here every day. I sit at a plastic table under the large umbrella tree. The soup arrives and it’s a beautiful thing: I just sit and admire it for a while; say what you like about people taking photos of their food, this bowl is gorgeous and warrants many clicks of my camera. The colours are great, almost luminous, and the shapes too are flowing and organic – it’s like a culinary version of Edvard Munch’s ‘The Scream’. The broth is full of electric, ‘dancing’ flavours: lemongrass, shallots, onions and mild chilli. 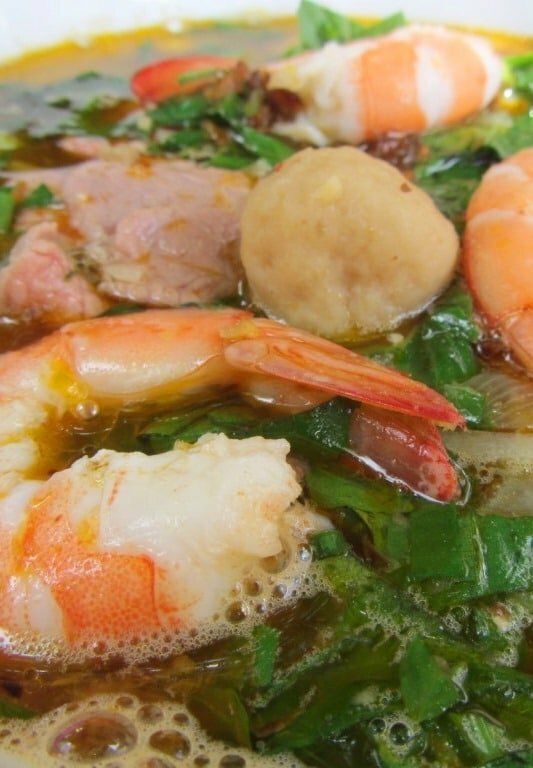 This soup is packed (as all Lunch Lady soups are) with ‘goodies’: squid, shrimp, beef, fish balls. It’s perfectly cooked so that the squid is soft and not too chewy, and the shrimp is moist and fresh (which is more than I can say for a great many other street food stalls). 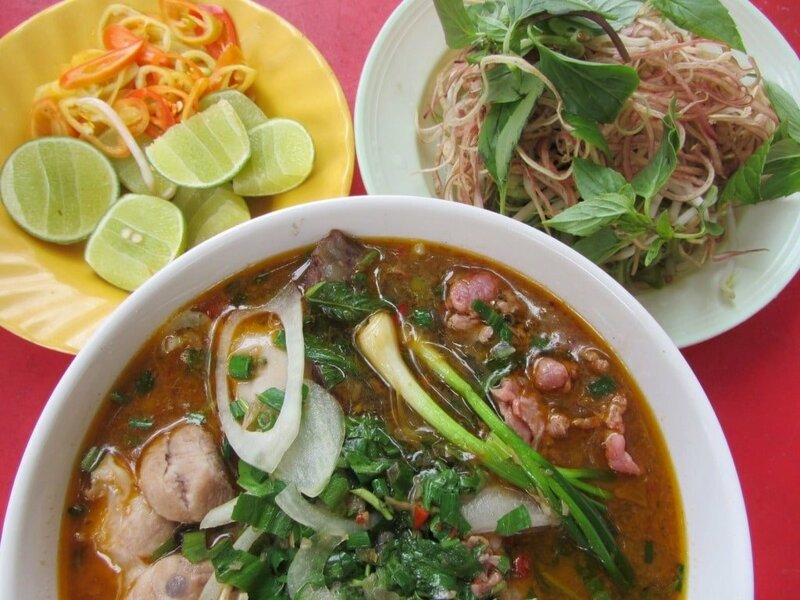 I add some bean sprouts, morning glory, and banana blossom for more crunch – not to mention more nutrition – and the all important squeeze of lime that, I find, brings all the flavours of a good soup together. Her broths have been accused of being too sweet and loaded with MSG, but I think today’s is well-balanced: light and tangy, yes, but certainly not too sweet. The atmosphere here, on the quiet corner under the umbrella tree, is very pleasant indeed. Other food vendors sell drinks and snacks to the steady flow of customers, most of whom are Vietnamese on their lunch break from offices nearby. 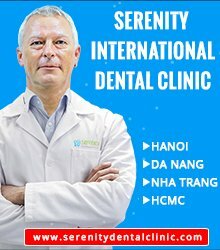 Ms Nguyen Thi Thanh is friendly, smiley and chatty, even when I ask – as politely as I can – if she charges both Vietnamese and foreign customers the same price (there have been rumours of foreigners being ripped off here in the past year). She explains there are two prices: 30,000VNĐ ($1.50) for a small bowl (actually the same size but with less ‘goodies’ in it) and 40,000VNĐ ($2) for a big bowl. Although this is more expensive than your average street food, it’s similarly priced to other ‘famous’ bowls of noodles in town, like Phở Phượng next door (45,000VNĐ), which I consider to be the best phở in Saigon. This is a cracking start to a week of lunches at The Lunch Lady, and the only reason I haven’t rated this soup with five stars is because I’m not as familiar with bún Thái as I am with others dishes, so I’m less able to compare this particular version with others that I consider top quality. Description: It’s hot and humid today, but there’s a little respite in the dappled sunlight at The Lunch Lady’s corner. Today’s soup is bún mọc (also spelled mộc), a dish originating from northern Vietnam. Again, it’s a very ‘good-looking’ bowl of noodles. In contrast to yesterday’s vibrant and contrasting colours, this soup has a harmonious, pale palette. A series of whites and grays, punctuated by the bronze of roasted shallots, gives it the appearance of a faded black and white photograph. 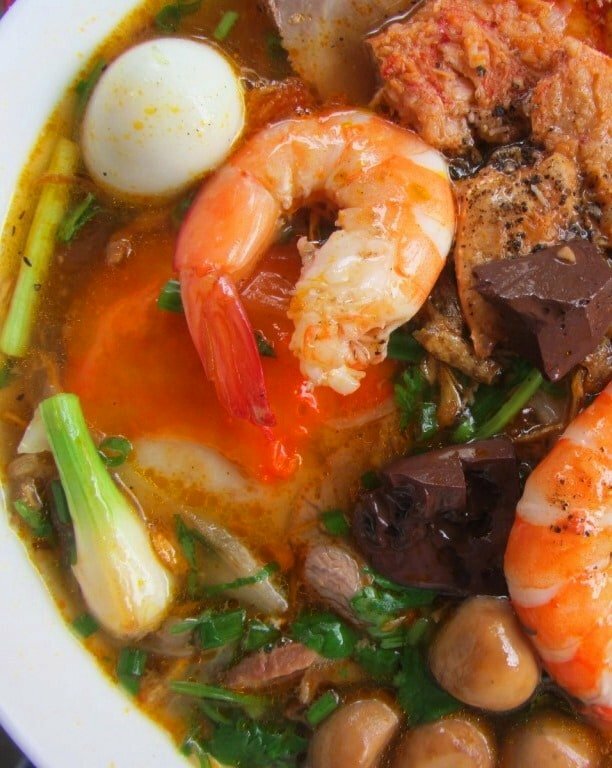 Bún mọc is a pork and mushroom based broth. This particular bowl has a meaty flavour with earthy tones from the mushrooms. It’s a surprisingly deep and dark taste for such a light and clear broth. 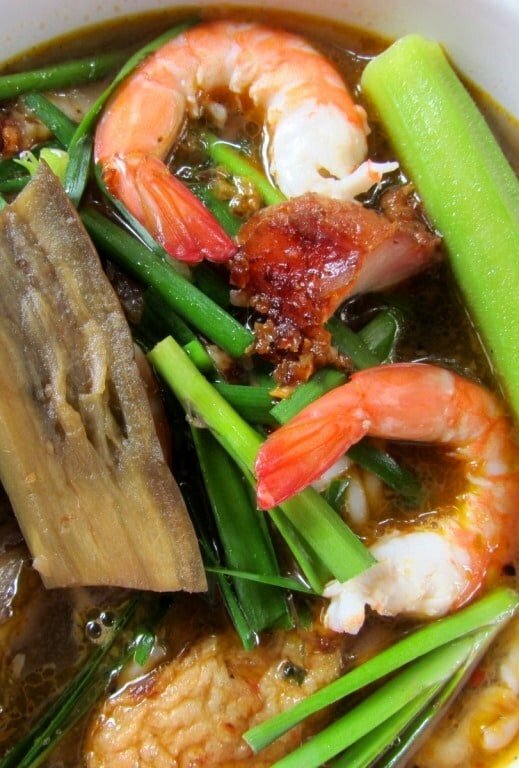 There’s a very strong presence of garlic and shallots, and tiny shrimp add a pungent punch. As usual it’s jammed with ‘goodies’: thin slices of boiled pork, chunks of cinnamon flavoured chả (a kind of meat loaf), pork and mushroom meat balls, pork ribs, and pig’s trotters. The latter are a bit too chewy, which is unusual as they normally melt in your mouth, having spent hours in the boiling broth. However, the meat and mushroom balls, and the cinnamon chả are exceptionally good. Again, I’m struck by the calm and pleasant ambience of this ‘foodie corner’. Vietnamese office workers (no foreigners at all today) tuck into their noodles, leaves on the umbrella trees rustling in the wind above their heads, while well-fed, healthy-looking dogs gnaw on discarded pork bones at their feet. At one point, a yellow-specked butterfly flits between my chopsticks and spoon. Atmosphere and environment are a big part of good Vietnamese street food. I’m not talking about cleanliness and table cloths – far from it – what I mean is a congenial, open-air, informal setting where food and surroundings combine to create the Vietnamese street food experience. The Lunch Lady has got this in spades: even if you don’t like the food here (which, on the evidence so far, would seem unlikely) it’d be hard to dislike the setting. Today’s soup is very satisfying: I have a big smile on my face and a light-hearted glow in my chest as I leave. The Lunch Lady’s bún mọc is not extraordinary, but it’s very, very good, and the overall experience is fulfilling. Description: I arrive at The Lunch Lady today after two hours of tennis in the kind of oppressive heat you get during the rainy season before an afternoon storm. Today’s dish is cà ri gà, which is Vietnamese chicken curry. I admit that I’m not too excited about the prospect of eating a curry after such a ‘hot’ morning, but the smell of spices in the heat and the look of the yellow broth being poured over potatoes and chicken begin to change my mind. This dish is quite ‘un-Vietnamese’: like so many of the best dishes (not just in Vietnam but all over the world) cà ri gà is full of foreign influences. 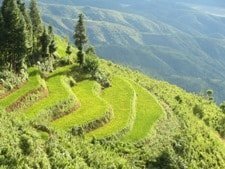 The use of coconut milk, coriander, and cardamon points more to the Malay Peninsular and the Indian Subcontinent than to Vietnam. As The Lunch Lady explains to me – while pouring out the golden broth – cà ri came from abroad but once it arrived in Vietnam it was ‘Vietnamized’ into the dish that now lays before me. It looks – as I’ve come to expect from The Lunch Lady – great. 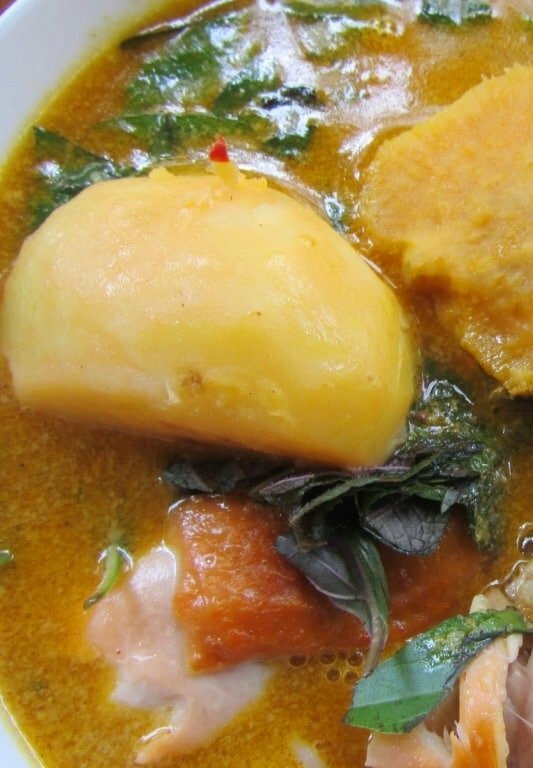 The yellow ochre of the broth is the result of lemongrass staining the coconut milk, and large chunks of potato and sweet potato have also picked up some of this colour. Several whole chicken legs, with their brown-glazed skin, protrude above the surface. This is a dense, compact, and chunky soup. But it lacks vibrancy. I’ve had bowls of Vietnamese curry that I could stare at for hours, with colours as bright and alive as a David Hockney canvas. By contrast, this curry has a gray, ‘unhealthy’ pallor. And the taste too is lacking some vital quality: there’s no depth, or vigour to the flavour. It’s a pleasant taste, but mild and inoffensive. I’m not a big fan of overly spicy food, but this curry is too timid, even for me. A curry should be hearty, warming and exciting; not mild and restrained. The chicken is soft and tender, but the vegetables are hard and chewy – not what you’d expect after hours boiling in a cauldron of broth. A group of my friends are here to join me today, and most of them seem to enjoy their bowls of cà ri gà. However, I can’t help but notice that many of their bowls are still half full when we all get up to leave; mine too, I’m afraid. 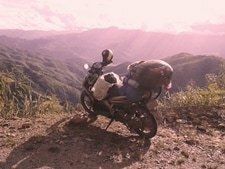 Description: A bird defecates on my bike – as has become routine these last few days – as I pull in to The Lunch Lady’s quiet corner, just as a light rain starts to fall from the ashen sky. It’s noticeably busier today, which makes me think that Thursday’s soup must be a famous one. In fact, the dish of the day is bún mắm, which is beloved by most Vietnamese but which most foreigners tend to leave alone. The reason for this is that bún mắm‘s base is a pungent fish sauce that produces a ‘distinctive’ aroma many foreigners find hard to appreciate. However, there are lots of non-Vietnamese here today to enjoy this fabulous soup, and plenty of rather glamorous looking young Vietnamese women in smart dresses and high heels too. The bowl arrives on my table. “Come on!”, I think to myself. “This is ridiculous.” The soup is so striking, so colourful, so gorgeous that it fills me with a kind of glee. Bún mắm is always a sight to behold, no matter where you eat it, but this one knocks me over with its bold shapes and bright colours. I wish Cézanne or Van Gogh could have visited The Lunch Lady and painted a still life of this bowl of soup, then I could hang it on my wall to look at every day. The soup is rammed with chunky ‘goodies’: roast pork, shrimp, squid, fish cake, okra, aubergine, even the bún (noodles) seem to be thicker than usual. The broth is deep, dark and brooding; this is more of a potion than a broth. I add bean sprouts, morning glory, banana blossom and a squeeze of lime just to introduce even more texture and flavour to this already overloaded bowl. It’s fantastic. The base of the broth is fish sauce, lemongrass, and aubergine, all of which makes for a very rich brew of fishy, salty, tangy and earthy flavours. Like yesterday’s curry, it is perhaps a bit too mild and too sweet. 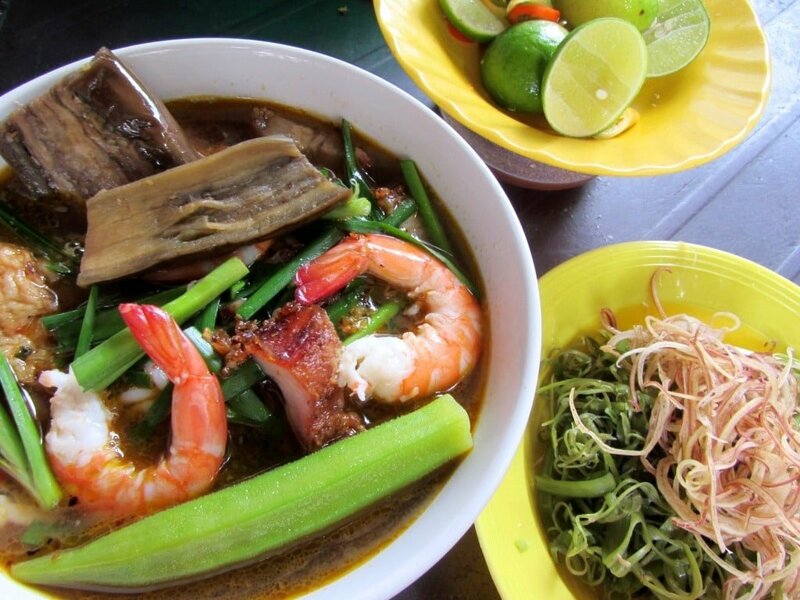 But, this is southern Vietnamese cuisine, famous for it’s sweetness: whether it comes from sugar cane, coconut juice, or MSG southern dishes, like this one, will always be sweet. Bún mắm is a soup I have loved ever since I lived a few metres from my favourite place to eat it in Saigon, so I feel I have enough ‘experience’ of this dish to say that The Lunch Lady’s version of this rich and complex soup is excellent. Bún mắm is a soup that pulls no punches: it’s bold and confrontational with big chunks and big flavours. It’s delicious and, judging by the increase in diners here today, plenty of other people would agree. Something I’ve noticed over that last 4 days at The Lunch Lady is that, although Ms Nguyen Thi Thanh herself is very friendly, relaxed and smiley, the rest of the staff can be quite grim, gruff and impatient. Also, while it’s true that there are two prices (40,000VNĐ a big bowl and 30,000VNĐ a small bowl [see Monday]) neither Vietnamese nor foreign customers are given the choice between the two. Rather, Vietnamese customers are always served the smaller and cheaper bowl, and foreign customers are always served the bigger and more expensive bowl. 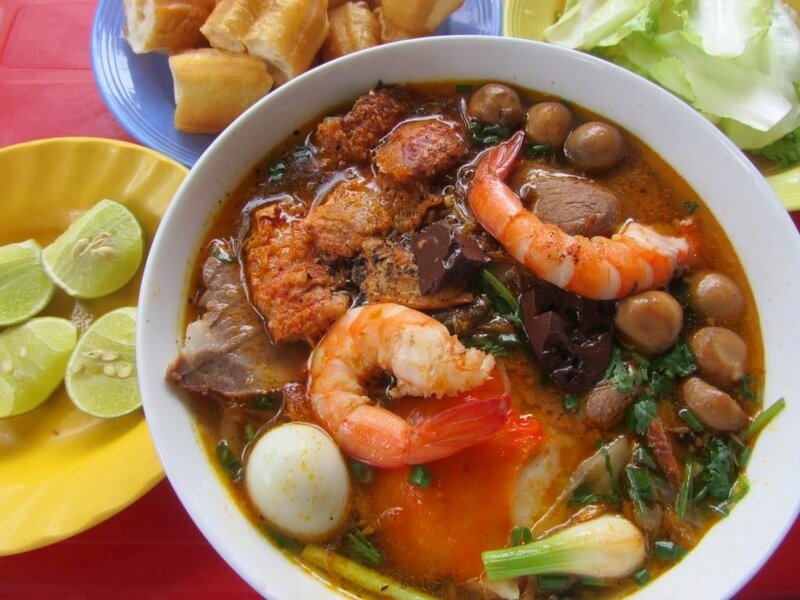 Description: Today’s soup is bún bò Huế, a dish that was born in the former imperial capital of Huế, in Central Vietnam. This soup is popular all over the country, and it was also the dish that Anthony Bourdain enjoyed so much when he visited The Lunch Lady a few years ago. Bún bò Huế is a spicy, feisty broth with a strong aroma of lemongrass and beef. 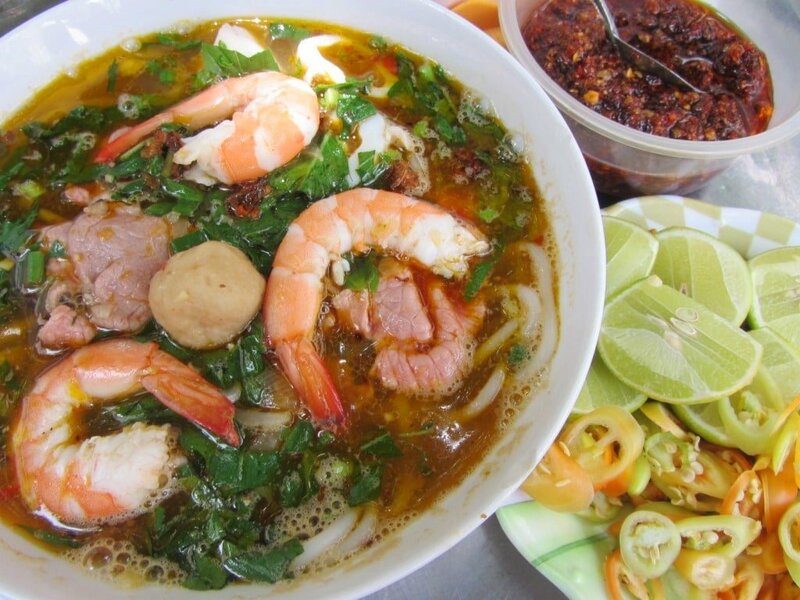 It’s the kind of soup that you can smell on the streets of Saigon whenever you’re near a stall serving it. So I’m surprised that I have to ask The Lunch Lady what the dish of the day is – I’d have thought that if it were bún bò Huế I’d have known immediately from the aroma filling this shady corner, but no. Even when the bowl arrives on my plastic table I still find it hard to believe that this is the soup she says it is. The broth is dark and a little viscous which is unusual for this dish: normally the broth is cloudy (but not dense) with a light brown colour. In appearance it’s not quite as arresting as I’ve come to expect from the Lunch Lady over the last few days. The colours are muted, and there’s not much ‘form’ to it. The taste is equally flat and ordinary. 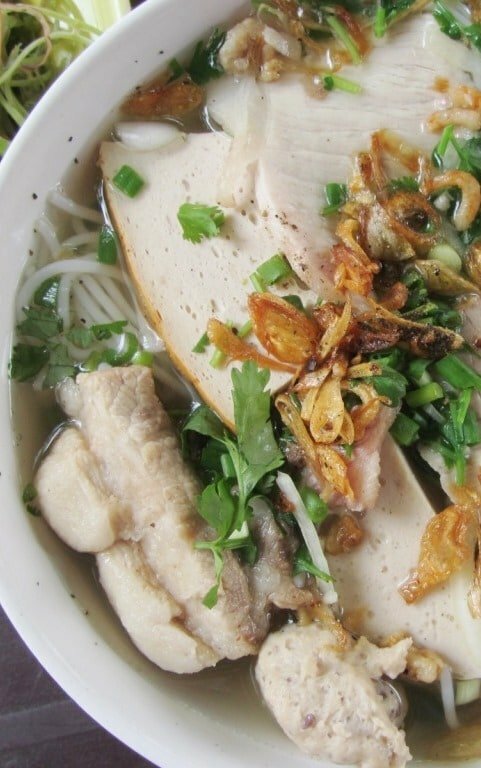 There isn’t the spice, kick, and fire that bún bò Huế commonly has. 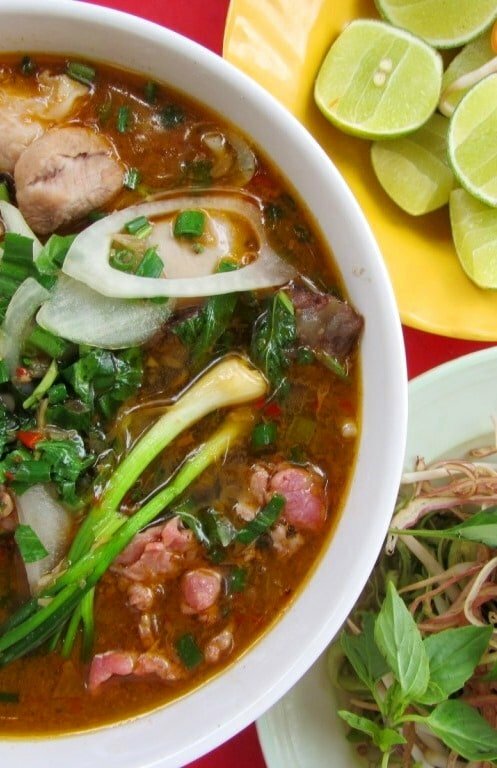 In the city of Huế, especially, there’s a real heat to this soup, and powerful citrusy notes from the lemongrass, all brought down to earth by the deep, meaty flavour of the beef. Unfortunately, today’s version has none of the above qualities. It’s a fine and pleasant bowl of soup, but there’s certainly no magic to it. I’m joined by a friend of mine today, and she also says that, while the soup is filling and good, it’s not spectacular. What it does have going for it is meat, lots of it. There’s beef brisket, pig’s trotters, a Vietnamese pork sausage, and some tender slithers of raw beef that cook gently in the hot broth. But, once again, the larger chunks of meat are chewier than I’d expect. Today’s dish is fine but not a great introduction to such a famous and beloved dish as bún bò Huế. Anthony Bourdain said that each mouthful of this soup was like “discovering new neighbourhoods”, but I’d say it’s more like being stuck in the same neighbourhood you’ve promised yourself you’d move out of for years, but, like Groundhog Day, find yourself still living in day after day, year after year: this is a very ordinary bowl of soup that you could find on most street corners in this city of food stalls. Description: I arrive a bit later than usual today, having come straight from work. It’s busier than on previous days, filled with ‘leisure eaters’ rather than local office workers. I feel overdressed in my white shirt and tie and, for this reason, The Lunch Lady greets me with, “Oh, very handsome today!”. I take my seat under the tree and am joined in the shade by two of my friends. There’s a deep, fishy aroma wafting over this quiet corner today, which can only mean one thing: bánh canh cua is dish of the day. This is a rich, fishy soup with thick noodles, and generous amounts of crab meat. Of course, the first thing we all notice is how beautiful it looks: the culinary version of a firework display. There are so many colours, shapes, and textures in this bowl that it’s a world in itself. Like Tolkien’s Middle-earth there are green, tranquil areas, dark, threatening, ‘mountainous’ regions, and mysterious ‘parts unknown’. The colours are bold, bright and exotic, like Gauguin’s Tahitian paintings. The fish based broth is golden brown; a warm amber colour like toast. And, like toast, this soup is warming, comforting, homey and somehow reassuring. It’s thick, rich, velvety; a luxurious broth. Even by the standards of The Lunch Lady this soup is crammed with ‘goodies’. There’s shrimp, fish cake, crab meat, quail eggs, beef, pork blood cake, and dozens of little button mushrooms. Strangely, the taste is mild compared to the aroma, but it still has all the fishy, salty flavour you’d expect from a seafood broth, tempered, as always, by lots of lemongrass, garlic, shallots, and onions. The famously slippery noodles – which constantly frustrate the hungry diner by falling off their chopsticks – are easier to manage than usual. 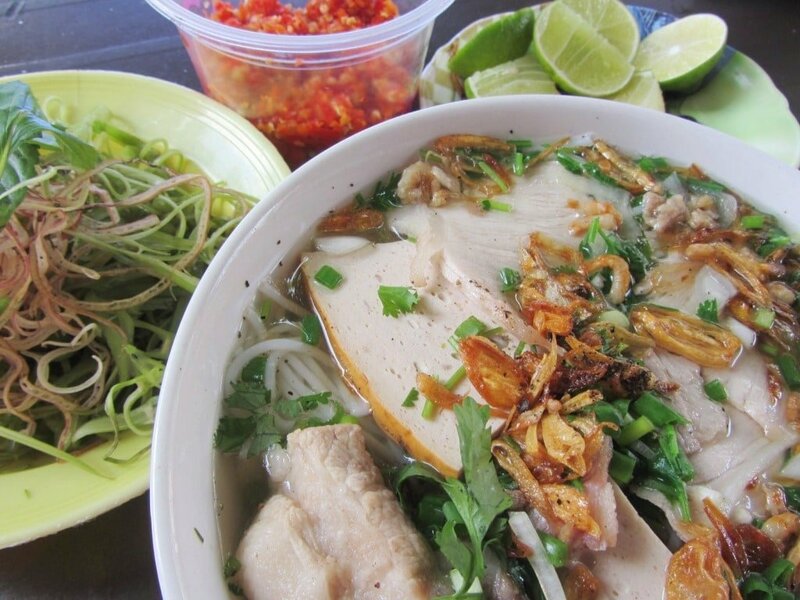 Bánh canh noodles are very different from most other Vietnamese noodles. Some people liken them to Japanese udon noodles because of their thickness. But they also have a gooey texture, which is very strange indeed. They’re commonly made from either rice or tapioca flour, but I notice that The Lunch Lady’s noodles have a red tinge, indicating, I think, that they’re made from brown rice flour. Today’s soup is bold, rich, and has so much body that it appears to occupy the whole of The Lunch Lady’s corner on this cloudy afternoon in Saigon. Description: Sunday is The Lunch Lady’s day off, but the ‘rotating menu’ continues to turn as the rest of the staff pull together to produce their own dish of the day. 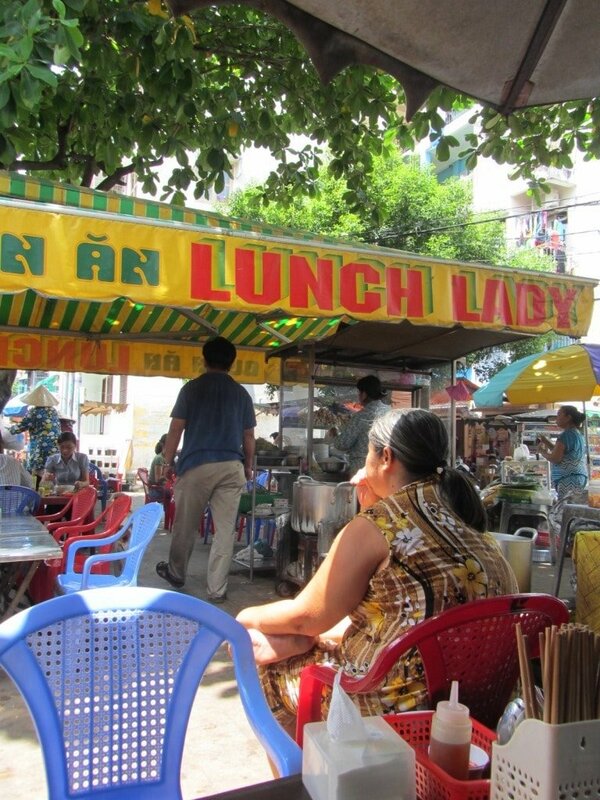 Noon on a Sunday is probably the quietest time of the week in Saigon, and so it is at The Lunch Lady’s stall when I arrive at 12:30, with just a trickle of (mostly foreign) customers gathering to eat under the shade of the umbrella tree. 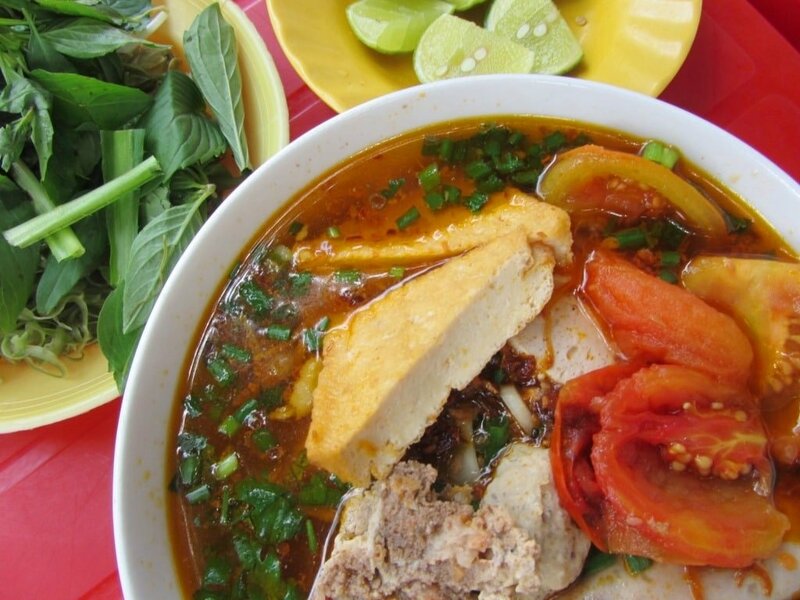 Today it’s bún riêu, a tomato and crab based broth that’s popular all over the country, but particularly in the north. There are many versions of this soup and the recipe changes slightly depending on the region. Wherever you have bún riêu, it’s always one of those Vietnamese soups that’s so loaded with ‘stuff’ that it seems as though the produce of an entire market has been thrown into one bowl. 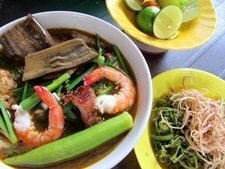 (My favourite bún riêu is in a small, semi-rural town in Ninh Bình Province, read about it here). Today’s version appears to be an amalgamation of all regional varieties. The soup, while colourful and chunky, has less form to it than on other days. Like an artist’s palette there are dabs of red and orange, smudges of green and gray, and there are lines, arcs and shapes, but none of it has any pattern or definition. All the shapes and colours run into each other, creating a confusing – but intriguing – soup to behold. The broth is surprisingly sharp and sour thanks to the long-stewed tomatoes. I find this a refreshing quality, especially after the general sweetness of the other broths this week. 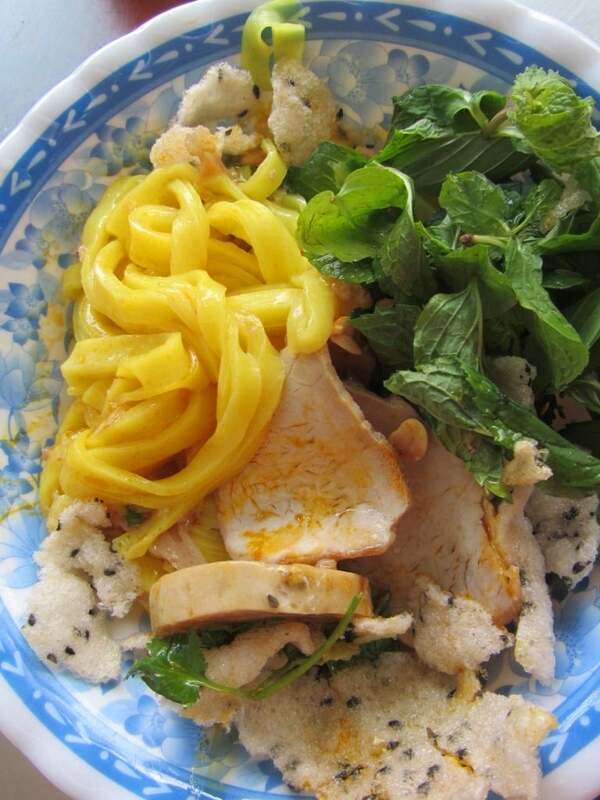 The bún noodles are thinner and lighter than on previous days, which again is a nice change. The addition of sweet basil, banana blossom, bean sprouts, and lime provide a much needed balance to the heavy chunks of ‘stuff’ in this soup, which include: pork slices, fish balls, tofu, crab meat, snails, Vietnamese pork sausage, halved tomatoes, and slices of cinnamon flavoured chả (a kind of meat loaf). The interplay of textures is great fun for teeth and tongue – it’s like a theme park offering different ‘rides’: soft, chewy, crunchy, crispy, tough, velvety, mushy, stringy. Overall, this is a good, solid bowl of a classic soup. 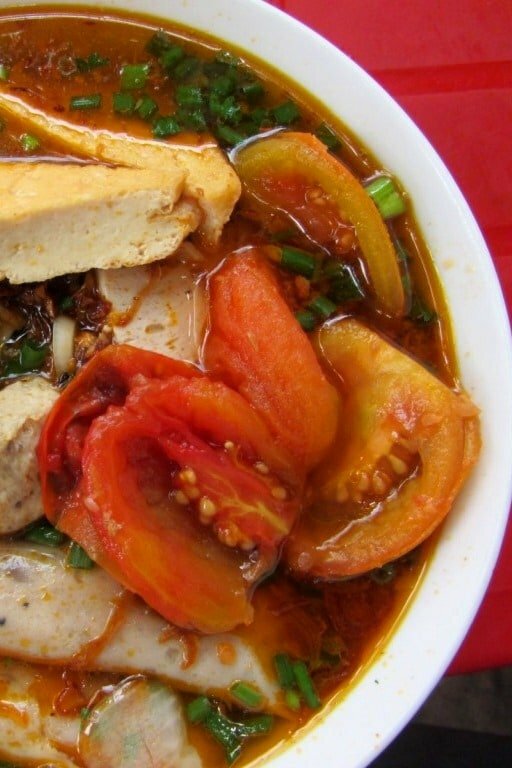 It’s very filling and fun to eat, but there’s nothing extraordinary that makes this version any more remarkable than other bowls of bún riêu available up and down this ‘soupy’ nation. I thoroughly enjoyed my week of eating at The Lunch Lady. The food is very good, the atmosphere on the quiet shady corner is charming, Ms Nguyen Thi Thanh is a friendly and polite host, and the ‘rotating menu’ keeps things fresh and new. All the soups are beautifully presented. It’s like visiting an art gallery whose collection changes daily, exhibiting the works of a different artist each day of the week – Monday is Munch, Thursday’s Cezanne, Saturday’s Gauguin. The ‘rotating menu’ is also a brilliant illustration of the variety that exists in Vietnamese cuisine: the contrast between, for example, the explosive colour and pungent flavour of Thursday’s soup with the muted palette and earthy taste of Tuesday’s dish. The location, ambience, and ‘set up’ of The Lunch Lady’s food stall – not to mention all the other ‘satellite’ stalls around it – is very ‘authentic’: there’s been no clean-up operation for the benefit of tourists. Plastic tables and chairs are all outside on the pavement, cooking and washing up happens in plain sight, and dogs roam the sidewalk picking up scraps wherever they can. It’s a great example of how enchanting street eating can be in Vietnam; an unassuming corner of the city becomes – seemingly without much effort or embellishment – an excellent open-air restaurant. Aesthetically then, The Lunch Lady could hardly be better. Gastronomically it scores well too. The soups are all delicious, aromatic, filling, and flavourful: a couple are magic, a few are very good, but one or two are ordinary. I find all The Lunch Lady’s soups to be more spectacular in appearance and aroma than in flavour. The broths are all just a little bit too mild to be exceptional. Ms Nguyen Thi Thanh says that she does her best to cater to her customers’ tastes, so I can’t help thinking that, maybe in the last few years since she’s been receiving more foreign diners, she might have ‘dumbed down’ the potency of some of the more powerful soups on her menu. Having said that, I’m judging each soup based on the expectation of the highest possible quality, because that’s the reputation that The Lunch Lady has gained over the years. The worst I could say of any of her soups is that it’s ‘ordinary’, by which I mean that it’s as good as you’ll find at other street stalls in Vietnam. A meal at The Lunch Lady is certainly good value. There’s a lot of soup for your money in every bowl. As for the reports of foreigners being overcharged, I think it’s more subtle and calculated than that. As I’ve mentioned before, there are two prices: 40,000VNĐ ($2) for a big bowl and 30,000VNĐ ($1.50) for a small bowl. By default all foreign customers are given the big bowl, and all Vietnamese customers are given the small bowl. There’s a little more soup and ‘goodies’ in the big bowl, so as rip-offs go this one isn’t too bad. However, foreign customers are always presented with extra side dishes, such as spring rolls and bread, that you could easily mistake for being complimentary, but when you get the bill you’re charged for them – this tactic isn’t used on Vietnamese customers. 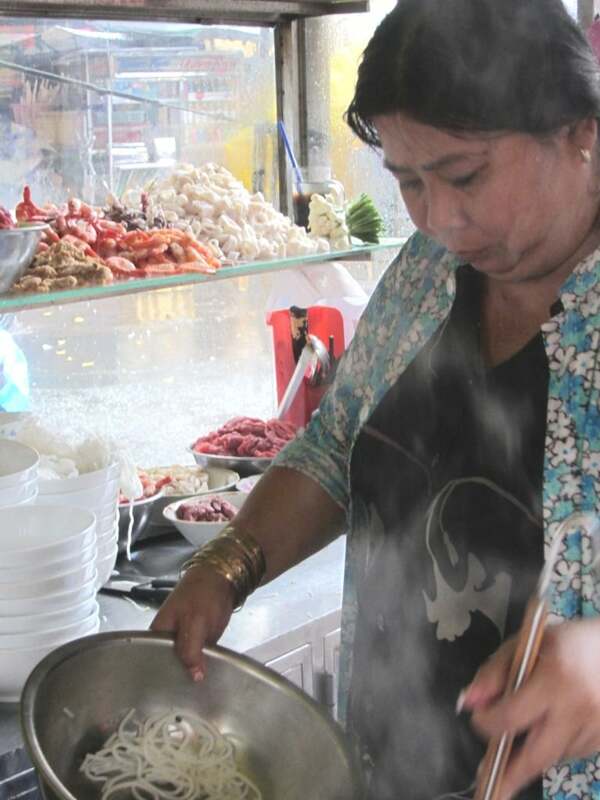 Does The Lunch Lady deserve her fame above all the other street food vendors in Saigon? On the whole, yes. Her soups are excellent if not exceptional; the magic of the presentation and the place make up for anything that the soup’s flavour is lacking. The ‘rotating menu’ while not unique is a great gimmick and a superb introduction to Vietnamese food for people who aren’t familiar with it. Most importantly I’m glad that The Lunch Lady is famous. This is a genuine Vietnamese street food stall that foreign visitors don’t have any qualms about visiting. This can only be a good thing as it will open travellers’ (and expats’) palates and minds to other street food stalls all over Saigon and the rest of Vietnam. I’d much rather The Lunch Lady be famous and frequented by tourists, foodies, and journalists than a fancy new place with air-conditioning and table cloths, and a menu that most Vietnamese people wouldn’t even recognize as their cuisine. Long may The Lunch Lady’s reputation last, and may she inspire travellers and long-term foreign residents to branch out and try more street food all over this country. This entry was posted in ALL, DESTINATIONS, FOOD & DRINK, Food Weeks, Noodles, Saigon, Soups, Street Food, The South and tagged Anthony Bourdain, blog, Ho Chi Minh City, review, Saigon, street food, the lunch lady, Vietnam. Bookmark the permalink. Read a great article after a long time. I have read your blog for the first time and I must say its awesome. Loved the way you write. And thanks for sharing this information. 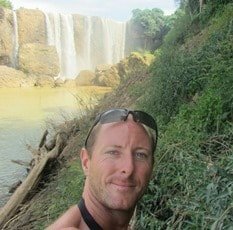 I am a travel blogger, any writing tips for me? 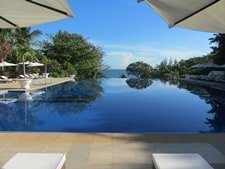 Pingback: 48 Hours In Ho Chi Minh City | WE PACK AND WE GO! I would be checking her out when I visit Saigon but I am there only on a late night – Tripadvisor states that she opens from 11 am – 2 am — so I might be able to visit around midnight – just double checking with you if that’s correct. I think it is very unlikely that the Lunch Lady will be open at midnight. I think it must be a misprint on TripAdvisor: it probably should say 11am-2pm. However, you will find other soup vendors still selling their noodles in Saigon at midnight. 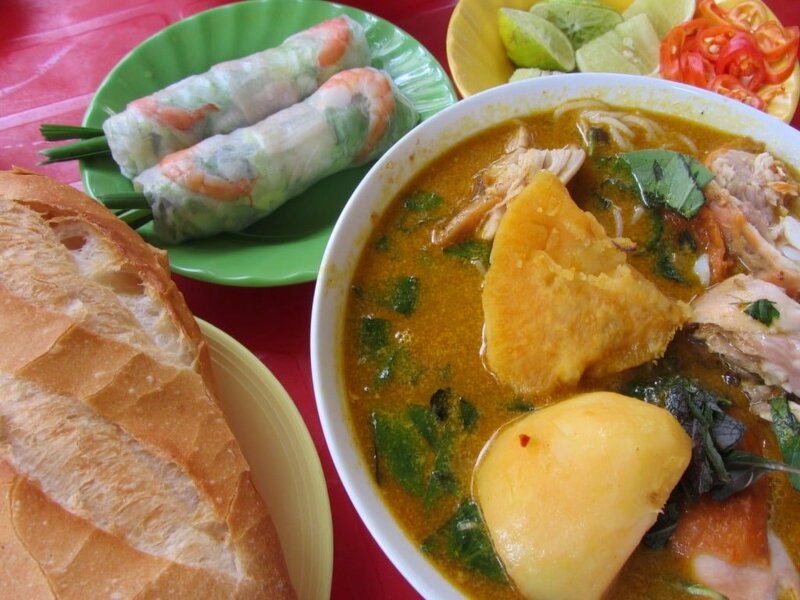 So hopefully you will still be able to find some good food on your brief late night visit to Saigon. Yes, people often say that Hu Tieu Nam Vang is ‘the’ southern dish. I like it, and will try to go to the places you mention. I think other dishes like bún mắm also have a claim as ‘the’ southern dish. Hey nice review! But what caught my attention was the very first photo which is of Mi Quang, yet there is no Mi Quang day? That is my favorite soup & would easily get me to the Lunch Lady. Thanks! Yes, that’s right, there’s no mì quảng day 🙁 The first image is a photo from Mì Quảng 85 in District 3, I’ve used it here purely as an illustration of Vietnamese noodles in the introduction. Find out more about Mì Quảng 85 in Day 4 of my Street Food Week here. Not been to the LL for a little while but I’ve felt it gets a little overpraised too often – so good to see such a considered review. I’ve never felt the other staff are unfriendly. Always get smiles and nods of recognition with my smattering of VNese. On the subject of ‘tourist friendly’ streetfood, I’m going to have a look around your site (I’ve only just discovered it today!) to see if you’ve written about the Banh Xeo place off Hai Ba Trung (opp the Pink Church). Now, that place is a rip-off and vastly overrated. Decent, but nothing special, banh xeo for 70,000 – against street prices of 25-30,000. I think it’s (fairly) recently had a refurb, so they’ve got to get their money back but even so… disappointing. Yes, I’ve been to that banh xeo place, but not for a long time. I liked it when I first got to Vietnam in 2005/6 – I remember the banh xeo were very large with a lot of filling. It’s another place made famous by Anthony Bourdain’s No Reservations show. Since then I’ve eaten banh xeo in many different places all over the country so perhaps my opinion of it would be different now. I’ll go back and try it again some day. Great write up, Tom! 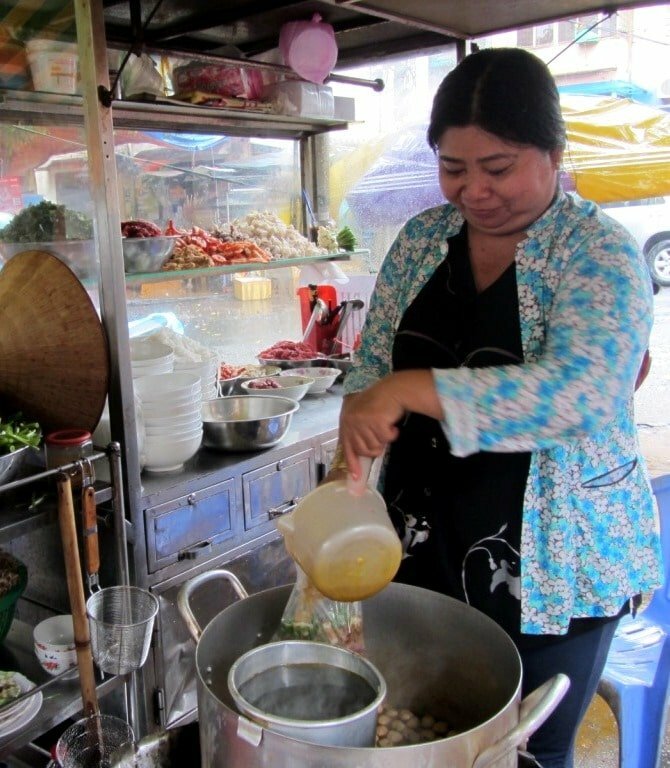 Yes, Bourdain’s Lunch Lady is a perfect example of local, traditional Vietnamese street food. I’ve always enjoyed her soups and find it to be wonderful value. It’s nice to see a run-down of her weekly menu as I’ve never known the variety she offers. Keep up the good work! Hope to see you at The Lunch Lady again sometime. I enjoy reading your blog but can you please get rid of the floating “share” panel, which even now is blocking what I’m writing and certainly blocks the text of your blog posts far too much. Glad you enjoy reading my blog, and yes, I’m aware of the problem with the share button on smaller screens: I’m in the process of redesigning my site and that’s one of the issues that will be addressed. I see the share panel is now hidden on the left, great improvement Tom. I don’t like seafood so I asked for the soup without shrimps. Good soup, not extraordinary but good and decent. Keep me posted with your experiences. No no no….. I’m sorry for what I will tell you. First of all, I am Vietnamese, and I’m glad to hear that you love Vietnamese food. Secondly, about the price. They are not the same for foreigners and the locals. For example, today I ate Banh Canh Cua at Lunch Lady. I called 2 bowls, and then they charged me for 60.000 VND. So it means that only 30.000 VND for one bowl. But if you are foreigners, you will pay 40.000. I know that 10.000 dont make any sense. But I dont like the way they charged you. I have saw many foreigners paid like that. Even last year or now, the price for the locals is still 30.000 VND for one bowl. Finally, I hope that my example dont make you guys hate Viet Nam and dont come back. Thanks for reading my reply. If there is any mistakes, please forgive me. Ps: I hope that I could make a list about street food in Saigon and share it to you. Thanks for sharing your experience. As I mention in this article, when I was eating at the Lunch Lady, she had two prices: 30,000 for a ‘normal’ bowl; 40,000 for a ‘big’ bowl: the (subtle) way she overcharged foreigners was by serving them the ‘big’ bowl by default, whereas Vietnamese customers get the ‘normal’ bowl.